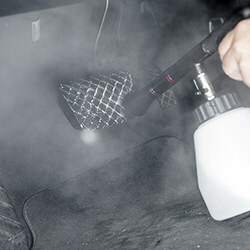 Professional car detailing not only consists of cleaning and care of the externally visible vehicle parts. The interior and engine compartment also need to be clean and fully functional. Commercial providers usually spend just as much time and attention on interior cleaning as with the steps of exterior cleaning. To help you get a better picture of the individual steps of interior cleaning we have sketched the most frequent steps of professional interior cleaning below. The individual steps are not ordered here according to importance or sequence. The only fact that matters is that a professional car detailer hands a vehicle to his customers in the end that shines and has been taken care of on the inside just as on the outside. The floor of the passenger compartment usually is the area soiled most. Dirt is carried inside here most readily and wiped off on the floor mat or carpet – especially in the winter when slush melts on the shoes and spreads about. 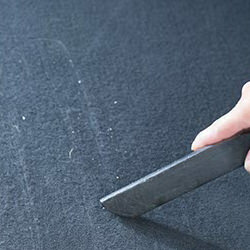 During car detailing mats and carpets are first vacuumed off and then cleaned with an interior cleaner or upholstery cleaner. A brush that removes animal hair can also be used for much soiling from dog hair. In most cases the floor mats can be removed and cleaned thoroughly and then dried outside the vehicle. After the complete interior cleaning has been finished, the dry mats are simply put back at their original place completing the clean overall appearance at the end. The largest area of the interior in terms of surface is probably the plastic trim, made up of many small and large elements. In most cases it consist of little sensitive and rather rugged material suitable for pre-cleaner and interior cleaner. Using such a cleaner and skilful manual wash with sponge or cloth the trim elements are quickly and effectively gotten rid of dust, soiling and, if applicable, nicotine deposits. 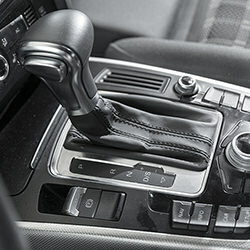 The cockpit trim, of course, also includes the area of the dashboard as well as shift lever and steering wheel, unless they are leather-covered. Pedals and other functional parts, however, must always be cleaned with special caution not to compromise the function of the parts. The roof liner often exhibits major discolouration and soiling, usually a result of normal air circulation in the vehicle as well as the outside when the windows are open. In some cases, pollution from nicotine is added. Nonetheless, because of its sensitive bonding the roof liner must be cleaned carefully. With car detailing this is either accomplished dry with the already mentioned interior cleaner or by using a shampoo suitable for the respective material of the roof liner. The roof liner is usually also vacuumed off first to remove the surface dust layer. Cleaning the roof liner is often neglected by many motorists during regular care, although it is right above the heads of the passengers and should be very clean already for this reason alone. Best remember this when cleaning your vehicle the next time. The boot also belongs to the areas where little attention is paid to normal cleaning. Professional car detailing, however, usually starts here first because interior cleaning is normally done from the back to the front. 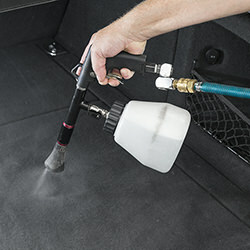 Depending on the material, the boot is vacuumed off and cleaned dry or wet. Of course, this also includes cleaning the spare tyre recess where must dust and abrasion of the spare tyre have often accumulated. Beyond this, the boot seams as well as the rubber seals of the boot lid need to be cleaned and sealed. This is especially important in the approaching winter when the seals quickly become brittle and cracked. However, good car detailing has the right products at hand here as well. Clean glass surfaces in the vehicle are not only an optical highlight but also important for safety in traffic. A clear view without stripes and streaks much improves safety in driving even with oncoming lights or poor weather conditions. Knowledgeable cleaning of the windows and mirrors in the framework of interior cleaning during car detailing is therefore very important. 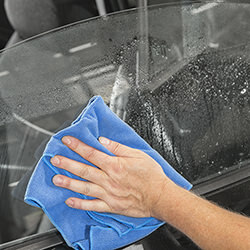 Professional providers usually use a special window cleaner or gloss cleaner to clean windscreen and rear window, rear view mirror and side windows without streaks. Good cleaners maintain this gloss even long after the treatment and prevent streaking effects. The rubber seals of the windows are also cleaned, of course, and protected with a sealer. Often forgotten and yet so important for the first impression of visitors and potential buyers: the door entry. Much dust and soiling from shoes and street dirt collects at this small step, which can be quite detrimental to the looks of the vehicle and is also unpleasant for the passengers. While the outer area of the door entry is cleaned during car wash, the area inside covered by the door is often overlooked. 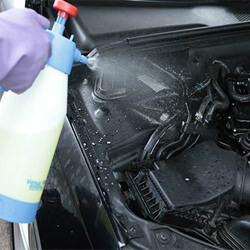 A professional car detailer, however, must make sure to clean also this area with the appropriate cleaner. This is usually done with an interior cleaner after the area was first vacuumed off. Of course, the seals of the doors must be treated the same way as the window seals, that is, cleaned first followed by sealing. Seat upholstery certainly belongs to the most sensitive materials in the passenger compartment. But it is just these textile parts that are normally soiled most – either from dust, minor accidents with food or simply perspiration, hair and skin scales. Similar as for the furniture at home, special textile and upholstery cleaners are also available for the car’s upholstery and seats. Upholstery and seats can be cleaned again with these gentle and yet highly effective little helpers. As part of car detailing the seats are normally first vacuumed off, followed by the application of upholstery cleaning foam, and rubbed off. Depending on the material and degree of soiling, this cleaning step may be repeated several times. At the end, you will not only enjoy clean seats but often also the wonderful fragrance of freshly cleaned car upholstery. Even more sensitive and demanding than seat upholstery are, naturally, elements from leather. These may be leather seats, but also steering wheels or shift levers from leather. In more luxurious cars the dashboard is also sometimes covered with leather. Obviously, these fine elements need to be cleaned with special caution not to subject them to lasting damage. 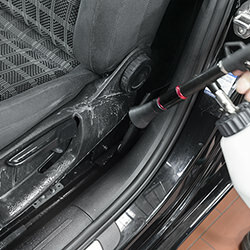 However, well-equipped car detailers normally carry special leather care products; they are effective enough, on the one hand, to remove soiling and deposits even from fine leather, but on the other hand, they are not aggressive but rather maintain the leather protecting it sustainably through a sealer formula. If your car has some leather inside, occasional professional car detailing is recommended even more. The interior of the car not only consists of the cockpit and boot. The engine compartment belongs to the interior and its cleaning is therefore part of interior cleaning in the framework of car detailing. The engine and other components of the engine compartment are naturally often very dirty as a result of the functional action of this area, exhibiting very stubborn since oily soiling. Mobility may be affected by such soiling and must therefore be carefully removed with a suitable cleaner. Rubber and plastic parts in the engine compartment, on the other hand, should be cleaned with engine compartment and cockpit lustre. Subsequent adequate drying of the engine is important before it may be operated again. Engine wash – regardless whether individually or as part of comprehensive car detailing – should therefore only be performed by trained expert personnel.